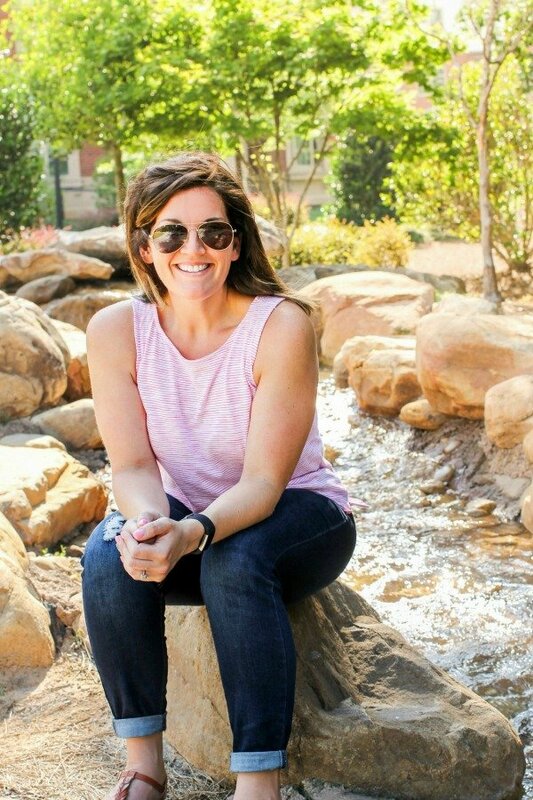 November 20, 2018 By Allyson 21 Comments This post may contain affiliate links. Read my disclosure policy. 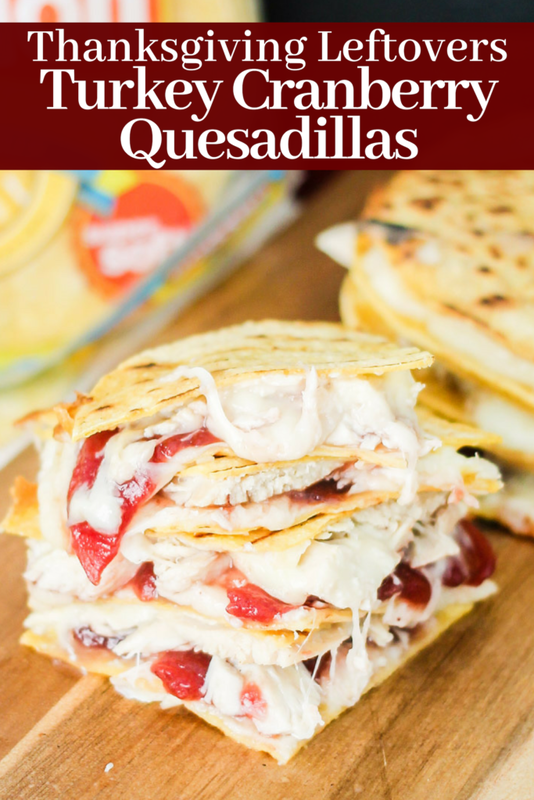 Corn tortillas filled with leftover Thanksgiving turkey, cranberry sauce, and melted cheese make these Turkey Cranberry Quesadillas the perfect day-after-Thanksgiving lunch or dinner! I absolutely LOVE the holidays, and as much as I love having family around, I love the food as well (hey, it’s my job!). My favorite part of Thanksgiving food is actually eating the leftovers. All the leftover turkey, mashed potatoes, macaroni and cheese, cranberry sauce, roasted veggies; I will take it all! Whipping up these Turkey Cranberry Quesadillas for lunch with family the day after Thanksgiving has turned into a yearly tradition that I adore! My family rotates hosting Thanksgiving every year. We normally bounce between my house, my mother-in-law’s house, or my husband’s uncle’s house. Thanksgiving is really just an excuse to get together with friends and family, but I love that we always make it happen because it’s such an important time. My kids love being with relatives and friends, and we try to demonstrate how important being together during these times really is. My kids also love quesadillas, so a few years ago I decided to put together after-Thanksgiving, leftover Turkey Cranberry Quesadillas, and they were such a hit, we’ve made them every year. 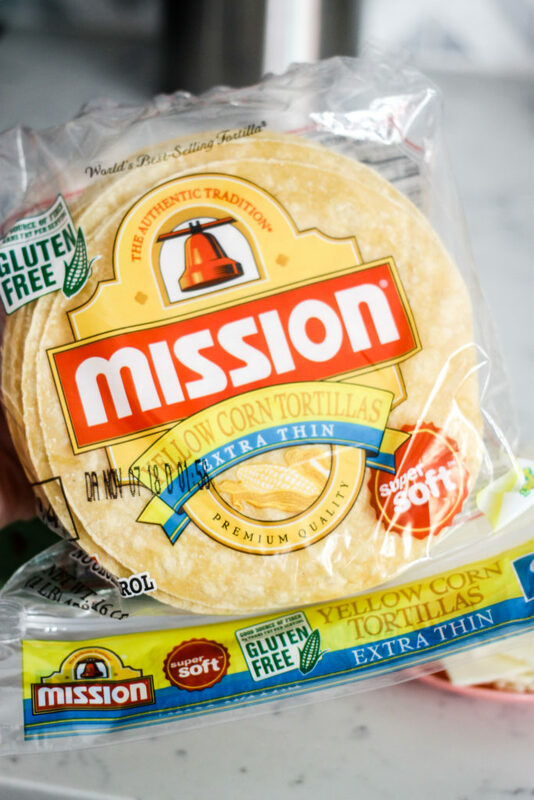 I only use Mission® Super Soft Extra Thin Yellow Corn Tortillas when I make dishes with tortillas, because they are the perfect size, we love the flavor, and they’re also so soft. They’re perfect for a variety of dishes. Insider hint: they taste best when warmed (instructions can be found on the back of the packaging)! 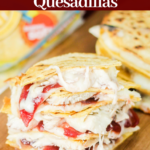 My kids love helping make these Turkey Cranberry Quesadillas as well, so I enjoy having that time together as a family, and showing my kids how to cook and help in the kitchen. Making the quesadillas is easy! 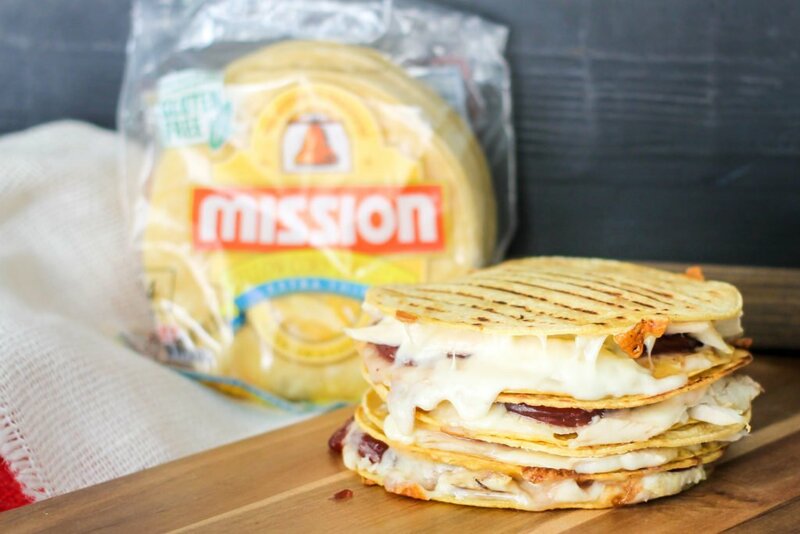 Get all of the ingredients together, including the Mission® Super Soft Extra Thin Yellow Corn Tortillas. Set everything up in an assembly line style. Assemble the Turkey Cranberry Quesadillas: 1 tortilla, 1 slice of cheese, 1/2 cup or so of leftover turkey, 1 1/2 slices of cranberry sauce, a little more cheese, and the 2nd tortilla. Heat skillet over medium heat, and spray with nonstick spray or coat with a bit of oil. Add quesadilla and cook for about 3 minutes, then flip and cook an additional 1-2 minutes, watching closely not to burn. Repeat for all quesadillas. Cut into 1/4 slices and serve immediately! 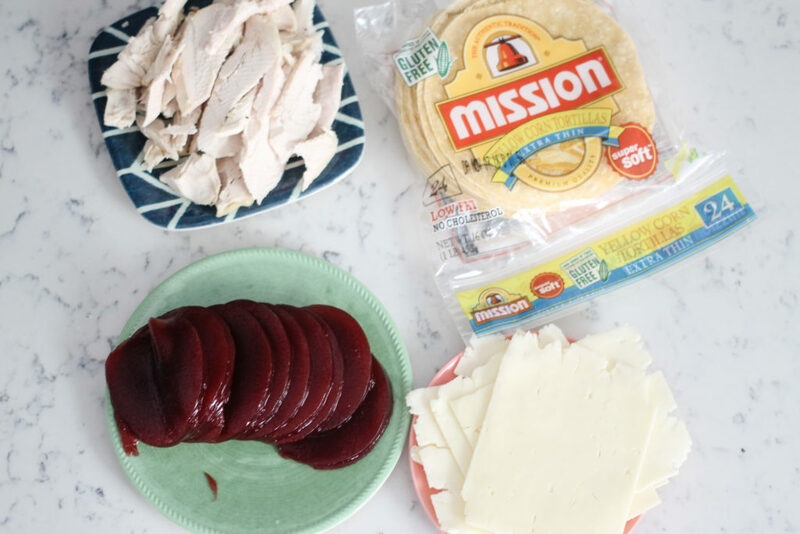 When making Turkey Cranberry Quesadillas, I love using Mission® Super Soft Extra Thin Yellow Corn Tortillas because they are so soft and crisp up nicely when cooked. They are made from Mission’s Maseca corn flour, which is the highest quality corn flour available. Plus, they are low-fat with no lard or cholesterol and are also gluten-free. They are available nationwide (store locator here). 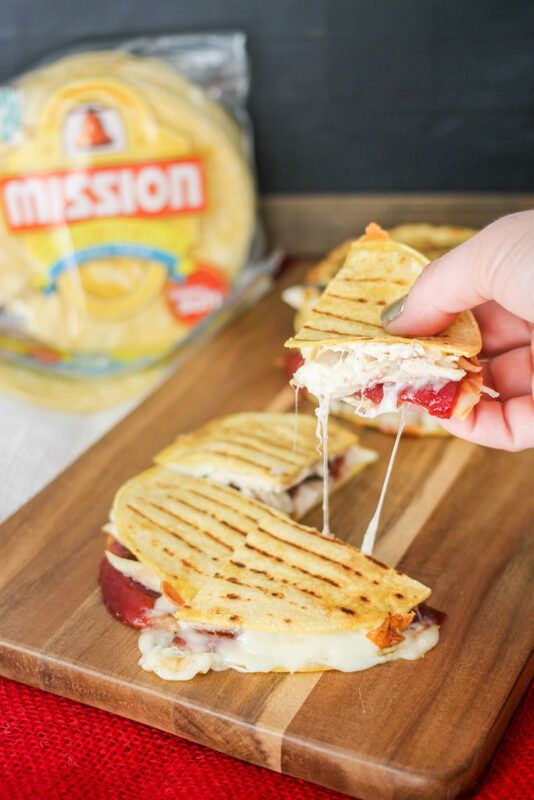 Assemble the quesadillas: 1 Mission® Super Soft Extra Thin Yellow Corn Tortilla, 1 slice of Havarti cheese, about 1/2 cup turkey, 1 1/2 slices of cranberry sauce spread out, a sprinkle of mozzarella cheese, and a 2nd tortilla. Repeat for all quesadillas. Heat nonstick skillet* over medium heat and spray with nonstick spray. Place quesadilla into skillet and cook about 3 minutes, then flip carefully and cook 1-2 more minutes, until browned and cheese is melted but not burnt. Repeat for all quesadillas. 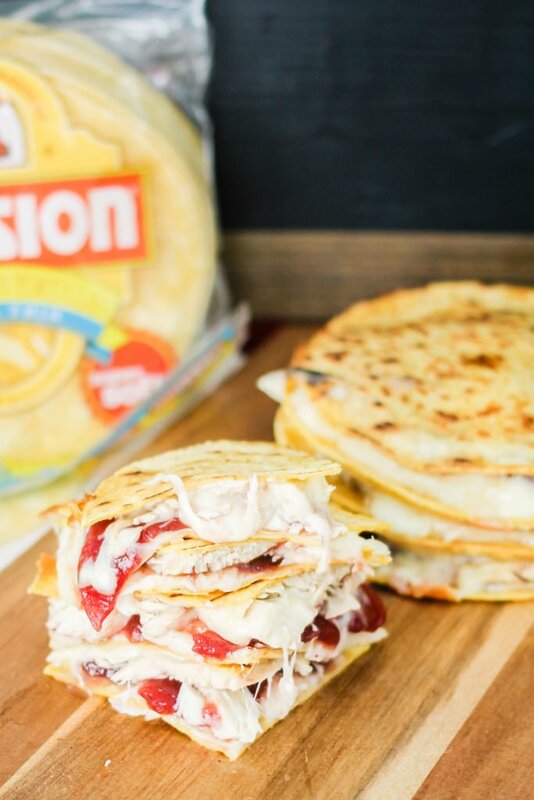 Cut turkey cranberry quesadillas into 1/4 slices, then serve immediately. *Alternatively, you can cook all the quesadillas at one time on a large griddle. Follow above instructions. We make these every year with our leftovers, SO good. This is the perfect use for leftover turkey! Looking forward to eating a ton more of these! I love this idea! These look so delicious and are such an easy way to use up those leftovers! I will have the perfect lunch on Thanksgiving Day with this wonderful and I’m sure the tasty recipe! You are GENIUS! And I’m happy to save your recipe. Ha! Thanks! You will LOVE them!!! Such a genius way to use up leftovers – so delicious! Looks incredibly delicious! Such a perfect idea, so excited to try this tasty recipe! You will love it! Happy Thanksgiving! Such a perfect Fall flavor combo! My will love these quesadillas for our movie night! This is such a great idea for Thanksgiving leftovers! Thanks for sharing! You are so welcome – you will love it! Such a delicious way to use up leftovers! Such a fantastic idea!! I can’t wait to try this!! I love this! I’ve got to try that for sure! I honestly love holiday leftovers! This is such a great way to switch them up. This looks so good! Such a great way to use up leftovers! YES! These really are the perfect way to use up leftovers! We’re a few days out from Thanksgiving and the leftovers are still in abundance….this is being made today! What an absolutely delicious way to use up those leftovers!! !